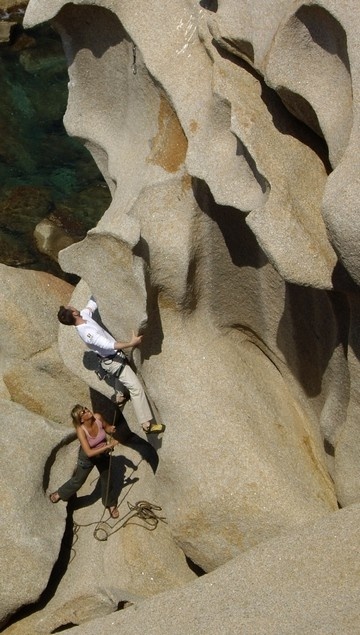 Sardinia has long been known as a rock climbing destination with its wild and spectacular rocky interior and coastline. There are many established sport climbing crags across the island. These sport climbing areas are mainly single pitch, though at Supramonte, situated between Dorgali and Oliena, there is a big wall rock climbing area with many bolted multi-pitch routes up to 400m long. Sardinia also offers some great granite bouldering. With its abundance of quality routes, cheap flights, and great weather for rock climbing throughout the year, it is easy to understand why rock climbing holidays in Sardinia have always been popular. There are various climbing sites we can recommend. 2 of them are about 20 mins drive from the villa. Half the routes presented above will not be easily accessible due to plant undergrowth. 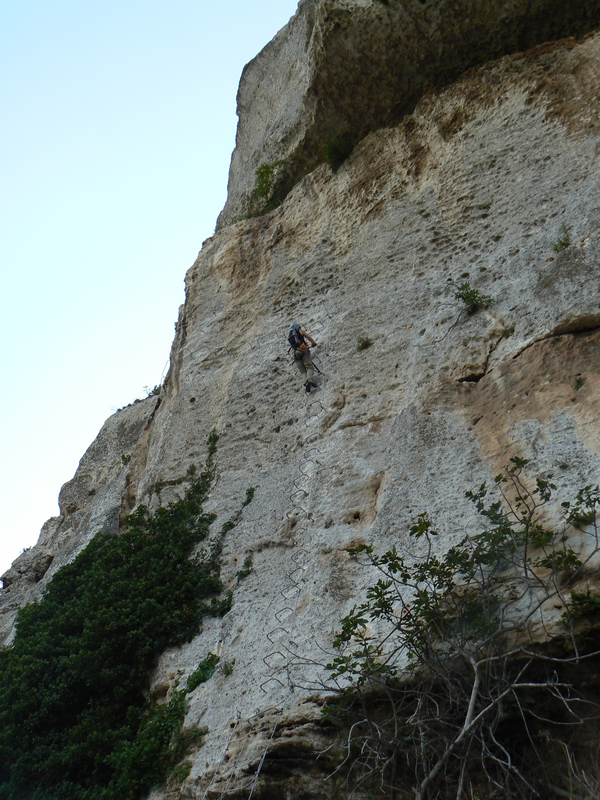 The main climbing is around Osilo, just to the east and south of Sassari, where there are several limestone crags, which offer good single pitch sport routes. To the west of Alghero, at Capo Caccia, there is some impressive sea cliff climbing on bolted limestone up to 70m long, as well as some Deep Water Soloing (DWS). There is also the crag of San Lorenzo (Osilo): “La stella di Argeade”. For the moment there are 9 routes, from 6b to 7b, 10 m of length. There is a crag near Ossi village with 15 routes, named Fortapasc. For the moment the hardest is rated 6c, but there are still some more projected. The routes reach 14 m of length. Sardegna’s third highest mountain range, Monte Limbara, is a special place. Dozens of beautiful granite domes are scattered around the mountain range, most of which are good climbing or bouldering destinations. The area is remote though it can be seen from the main northern highway SS597 between Olbia and Sassari. Its highest summit, Punta Ballestreri (1359m), is defaced by countless radio, television and radar antennae but the likes of Monte Biancu, Monte Lisgiu or Torre Littaghesu make more than up for it. Much of the range has been fenced off (thanks no doubt to the radar installations) but can be hiked and climbed nevertheless. Climbing is restricted to “clean climbing” – no new pro allowed to be placed. One more note: the trails wind through the Sardinian macchia – the undergrowth typical for the mediterranean islands of this area. It consists mainly of wild roses, raspberries, thistles, nettles but also spice bushes like rosemary, thyme and sage. This should give you an inclination of what I want to say: you better wear long trousers just to reduce the bloodletting. Punta Cugnana (650m) and neighbouring Punta Balbacanu (420m) are typical mountains for the northeastern part of the island of Sardinia (Sardegna). Built from red granite they form bizarre formations due to a typical erosion form called Tafoni . These erosion forms are typical for the islands of Corsica and Sardinia but of course occur in other places as well. Punta Cugnana though not remarkable in height offers some very typical views of the bizarre, masklike formations and is very easily accessible. You’ll be able to reach the tops with class III climbs and there are a lot of bouldering possibilities. Nevertheless the area is not so much known for climbing, probably due to the fact that many of the formations have razor sharp edges. 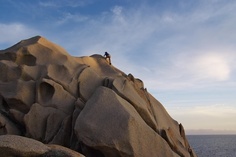 There are many more climbing sites in Sardinia. Please look online if you wish to go further afield. We haven’t found many via Ferrata in Sardegna. However, there are 3 within easy reach of the villa . Check the post from the 9th of January 2015 about us climbing 2 of them : the via ferrata del cabirol in Alghero and the via della regina in Monte Leone. Plenty of pictures and extra details !! 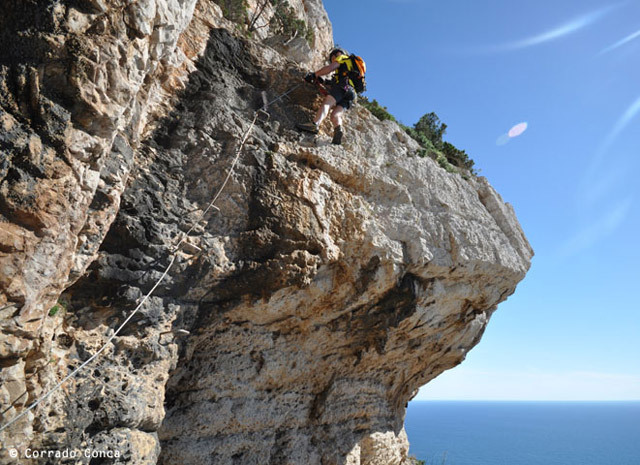 There is one near Capo Caccia nearAlghero called “Via ferrata del Cabirol”, 1H30 drive away. Another via ferrata we know of is in the village of Cargeghe, near Sassari . It is called “ via ferrata di Giorre” and is about 40 mins drive from the villa. The final and third local one is the via della regina in Monte Leone Rocca doria ( south of Alghero) , about 1H40 mns away. Check out http://www.ferrataregina.it/ for details.